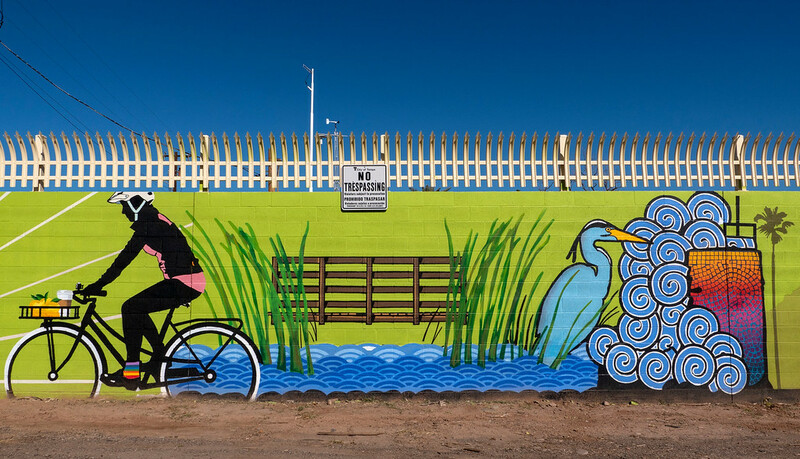 Tempe is a treasure trove of urban and outdoor adventures. 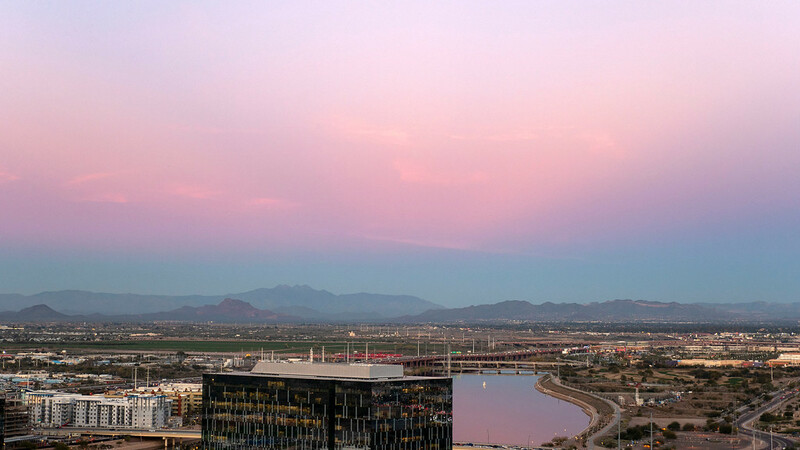 What do you know about Tempe, Arizona? I have to admit that I didn’t know much. Even though many Canadians and Torontonians escape to Arizona, especially in the winter, I’d never set foot in the state. Thankfully, that was all about to change. Tempe Tourism kindly invited me to explore Tempe and I was beyond thrilled. How could I resist three days in the gorgeous sunshine in January? It didn’t take much convincing. I was certain that there were so many exciting things to do in Tempe. Tempe is a city that borders Phoenix, and it’s closer to the airport than some parts of Phoenix itself. There aren’t any defined borders between Phoenix and the neighboring cities of Tempe, Scottsdale, Mesa, and the list goes on. You could drive from Phoenix to Tempe to Scottsdale and not even realize that you’re entering a different city. Tempe is a youthful and somewhat quirky college town, home to Arizona State University (ASU), one of the largest universities in the USA. It’s in the desert, so it hardly ever rains there. I spent day after day there and only observed blue skies with hardly ever any clouds. Tempe boasts 330 days of sunshine a year. Arizona has a very dry heat. It’s not at all what I’m used to. In Ontario, it gets very humid and sticky in the summer. You don’t need to worry about that in Tempe, although you need to remember to drink lots of water. Here’s to not sweating as much! Arizona is one of two US States (the other is Hawaii) that doesn’t change the clocks for Daylight Savings Time. When I told my friends that I was going to Tempe, they all wanted to know what I’d be doing there. 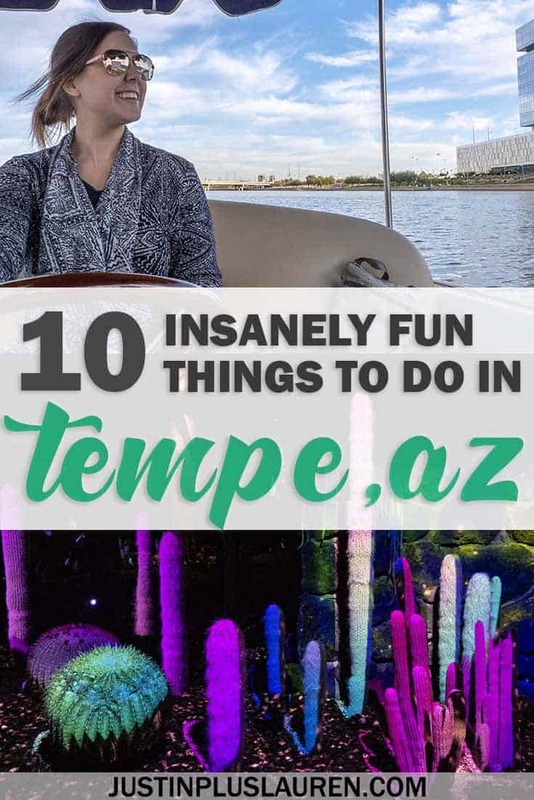 There are so many exhilarating and unique things to do in Tempe AZ. While I only spent three days in Tempe, I could easily visit again and again. Depending on your travel interests, there’s something for every taste: the outdoor adventurer, the foodie, those seeking arts and culture, the luxury traveler, the budget traveler, and the list goes on. With my love for hiking, nature, vegan food, public art, coffee, beer…well, Tempe has all of those things! Here are the 10 insanely fun things to do in Tempe that you’re allowed to steal to create your perfect Tempe itinerary. Would you rather watch my trip to Tempe? I’ve put together this Tempe travel video to show you exactly what to do in Tempe. Through this travel vlog, you’ll see precisely how I spent my 3 days in Arizona. 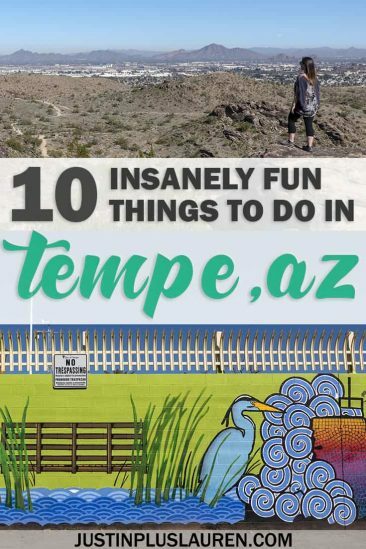 You’ll see all of the fun things to do in Tempe and I really hope it inspires you to travel there. 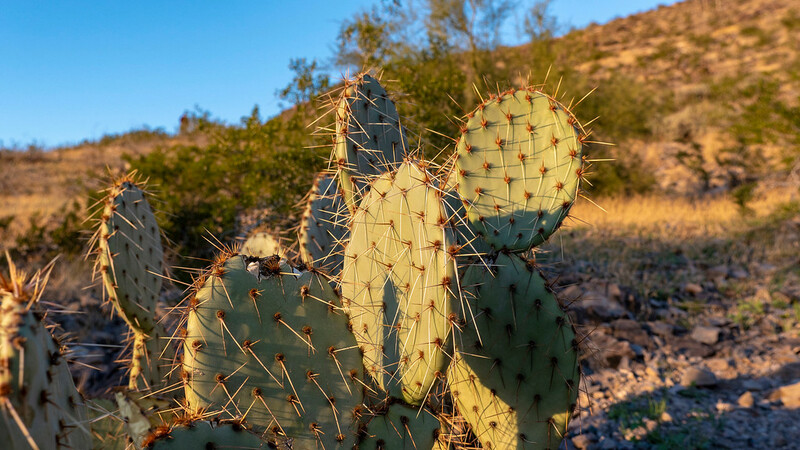 If you’re a hiking enthusiast, you’ll love traveling to Tempe. 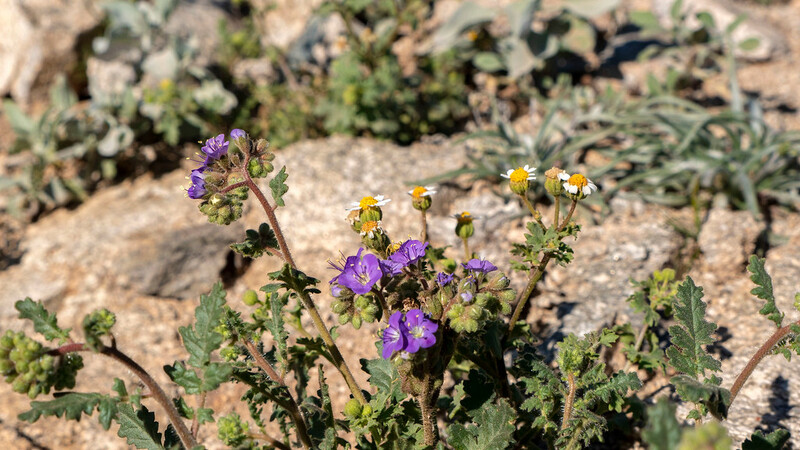 There are so many hiking trails in Tempe where you’ll be rewarded with sprawling desert scenery. Explore the local mountains on miles of trails with iconic lookouts for both the sunrise and sunset. 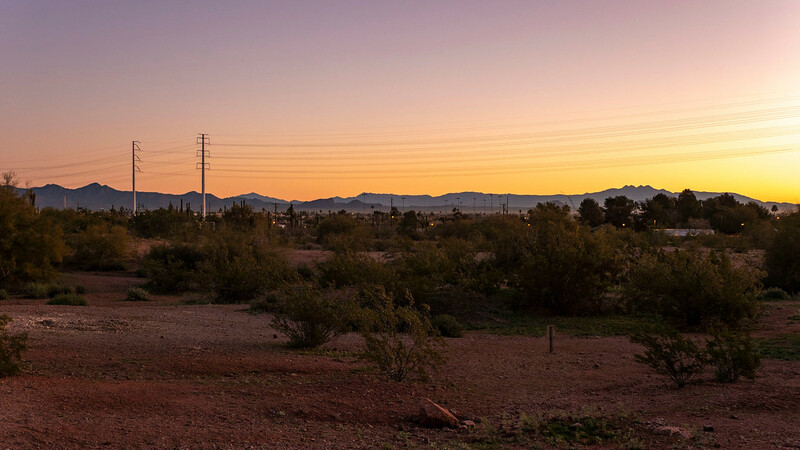 There’s nothing quite like Arizona skies at daybreak and dusk. My first views of A Mountain were right from my hotel room window. “A” Mountain, otherwise known as Hayden Butte, is a little mountain right in the middle of downtown Tempe. It’s one of the best things to do in Tempe right before sunset. The hike to the top is relatively easy (with a few giant steps for my short legs), and the panoramic views from the top are beautiful. It’s a great way to become oriented with the layout of the town, with downtown Tempe on one side and Tempe Town Lake on the other. Plus, the sky looks absolutely brilliant from the top of A Mountain Tempe as the sun goes down. 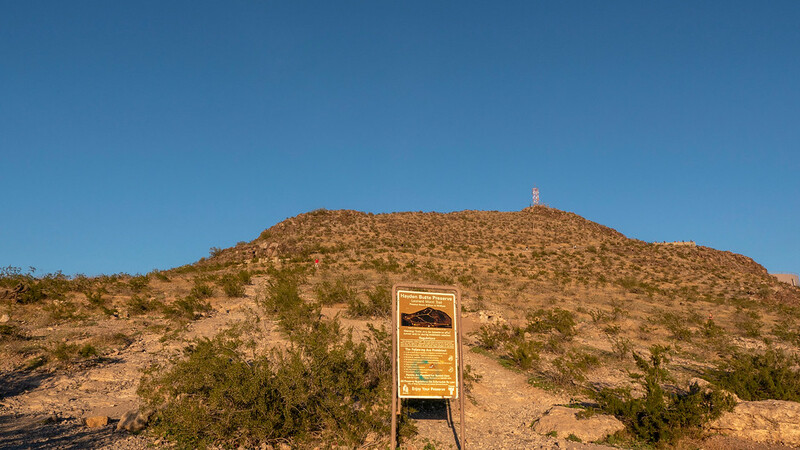 While its officially called Hayden Butte, no one in town calls it that. A Mountain is quite a literal name (yes, it’s a mountain! ), but it pays tribute to the local university, ASU. The letter ‘A’ first appeared on the side of the mountain in 1938, formed out of loose rocks. 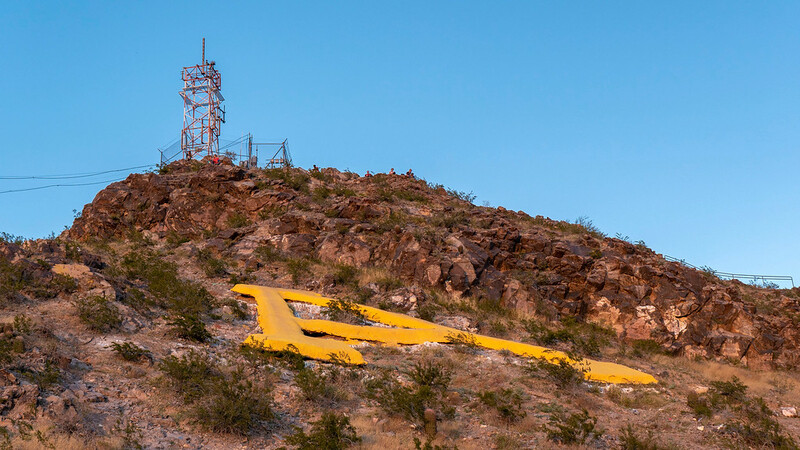 The university built a permanent letter A on the side of the mountain out of steel and concrete when they officially were named Arizona State University in 1955. 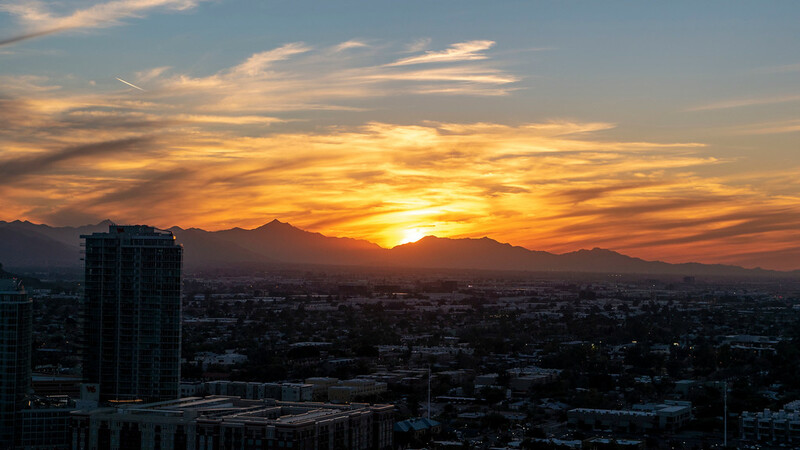 A Mountain Tempe is the perfect sunset hike. It won’t take you long to reach the top of the hill and there are a few places to stop along the way. Admire the desert landscape from up above. It’s one of the most accessible hikes from the downtown core and one that you can easily add to your day before dinnertime. 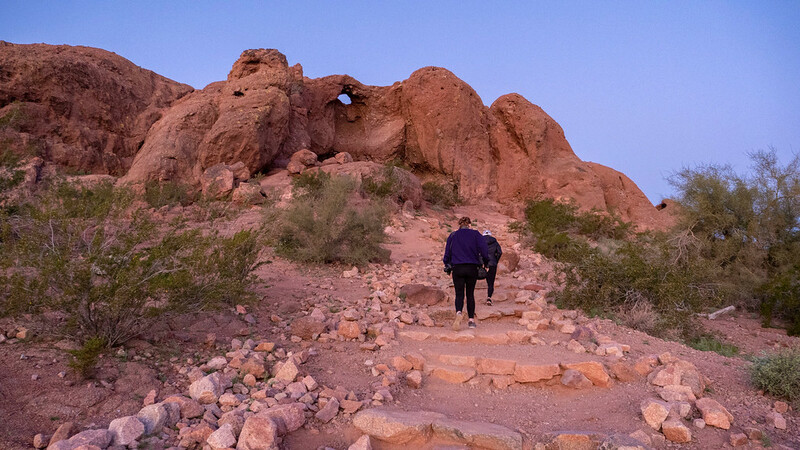 Papago Park offers several hiking and walking trails around its massive sandstone buttes. These paths are generally easy treks without too much of an incline. While it’s not the largest park in the area, it covers 1200 acres of park and recreation, which is still quite sizable. There are many popular attractions at Papago Park, including the Desert Botanical Garden. 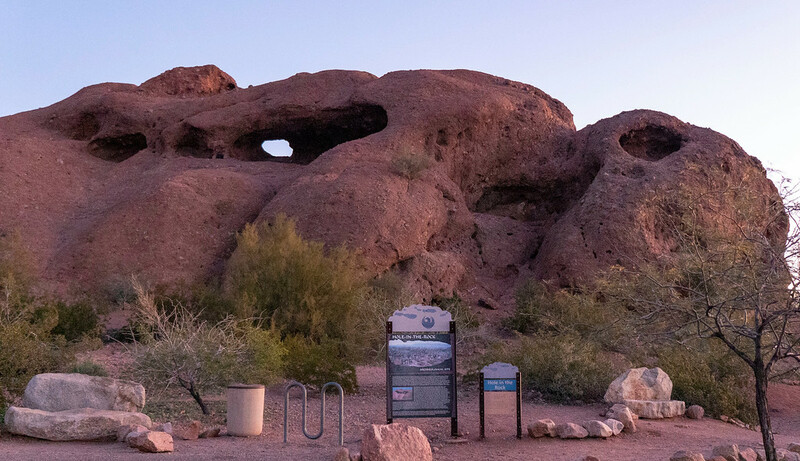 The most traveled hike at Papago Park leads to the aptly named ‘Hole in the Rock’. You really can’t miss it – there’s literally a hole in the rock. You’ll see the hole as you approach the hiking trail. Follow the path as it winds around the mountain and it’s just a short hike to the top. 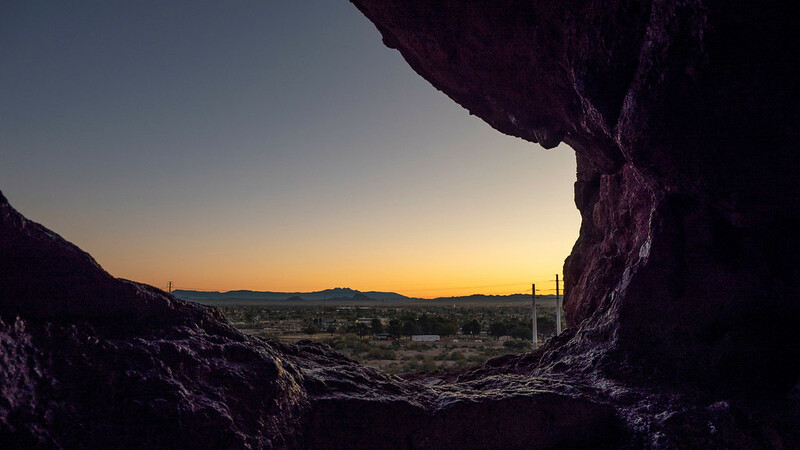 From the hole in the rock, you can savor beautiful scenery of the park. I recommend that you go Hole in the Rock to watch the sunrise. Even though you might not be an early riser, it’s absolutely worth losing a little bit of extra sleep. The sky lightens at a rapid rate, from the darkness of night to a yellow glow on the horizon. Once the sun rises, the light illuminates the buttes and boulders, appearing more vivid and vibrant than ever before. When I visited Tempe, the sunrise was around 7:30am, which isn’t nearly as hard to wake up for as the time I watched the sunrise at Cape Spear in Newfoundland (at 5:15am!). 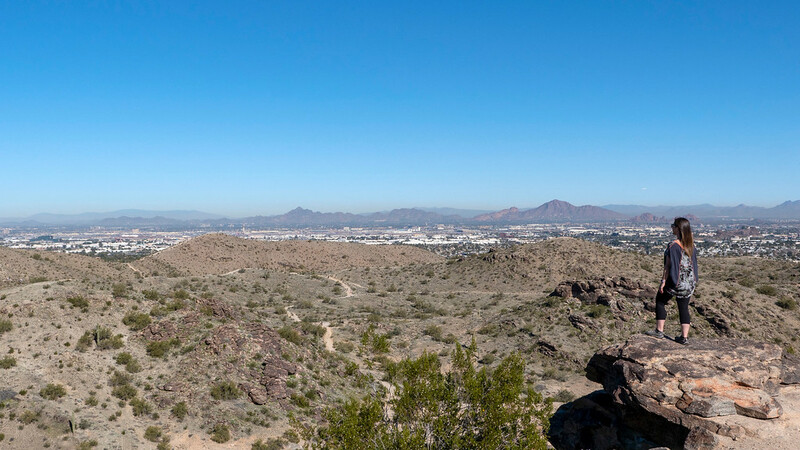 South Mountain Park and Preserve is one of the largest municipal park in the USA at over 16,000 acres. It consists of three mountain ranges, Ma Ha Tauk, Gila and Guadalupe. There are over 51 miles of hiking trails for walking and biking, so you’re truly spoiled for choice. 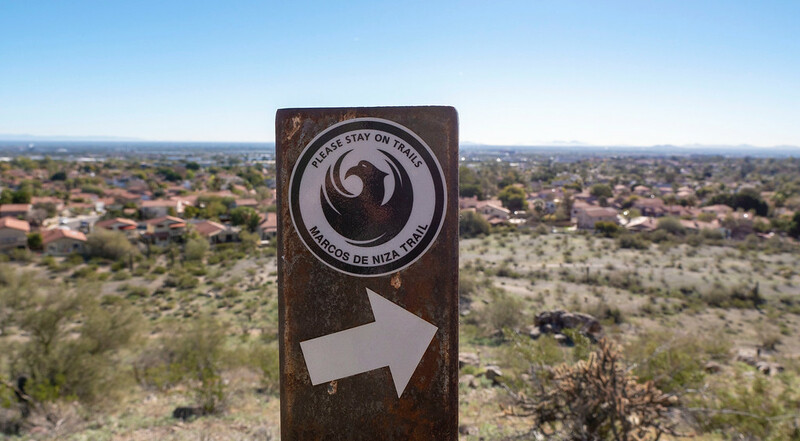 Along with a fellow travel writer and the Tempe Tourism team, we hiked the Marcos De Niza, named as the best hiking trail in Phoenix. Once you find a parking space at Pima Canyon, the trail begins right away as you start your trek up the mountain. The trail winds around the mountain, so it doesn’t get terribly steep at times. While it’s the lengthiest hike we tackled in Tempe, it still wasn’t too strenuous and I’d still classify this one as an easy hike. 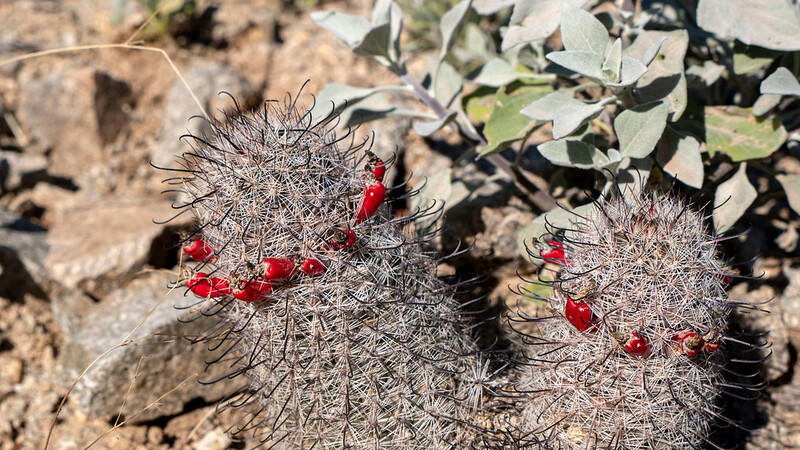 As I encircled the mountain, stepping closer and closer to the top, I noticed many interesting cacti and wildflowers, flourishing in this arid climate. After stopping a few times to snap photos, admire the flowers, or take sips of much needed water, we reached the top to enjoy the sweeping views of Tempe and distant mountain ranges. It’s a fabulous spot for photo opportunities, even if just to prove that you made it to the top. From there, you can connect to other hiking trails and continue your journey, or return back to the bottom to the car park. Prepare to be dazzled! Electric Desert is an exhibition at the Desert Botanical Garden, and it was one of my favorite things to do in Tempe AZ, without a doubt. 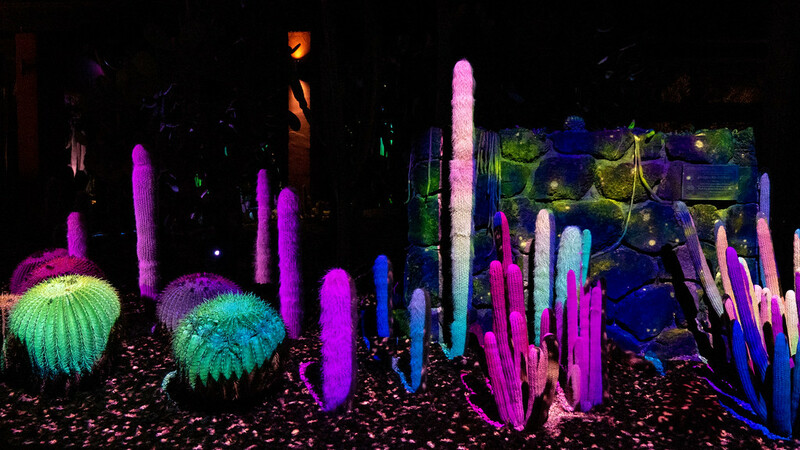 The cacti and plants at the botanical garden come to life in the darkness of night for a magical experience. The installation by Klip Collective unites desert landscapes with an engaging lights show and moody soundscapes, perfectly in sync. Visitors can expect a mesmerizing and immersive journey through seven site specific locales, inspired and related to that particular garden. I was absolutely amazed by Electric Desert. Light projected perfectly onto each needle of every cactus. At times, the lights and my imagination transformed the cacti into otherworldly creatures or underwater seascapes. I watched some of the same garden scenes over and over again because I simply could not get enough. 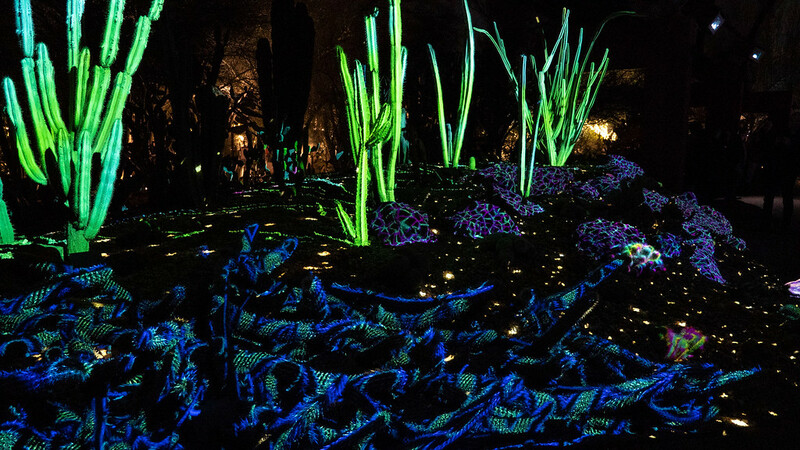 The photos of Electric Desert really don’t do the exhibition justice; if you’re unable to make it out to the event itself, please watch my video above to see the gardens in action. It’s one of the best things you can do in Tempe at night. 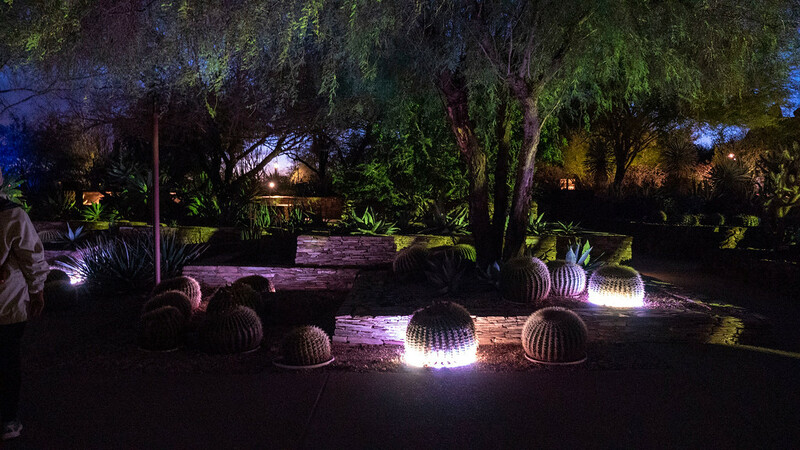 The exhibit at the Desert Botanical Garden starts after dark and costs $24.95 – $29.95 for adults and $12.95 – $15.95 for children and youth. I highly recommend purchasing tickets in advance as it’s quite popular and does sell out. The display only operates until May 12th, 2019, so get there while you still can! After an exhilarating hike, you might find yourself a little thirsty! I recommend checking out one of the best breweries in Tempe, Four Peaks Brewing. Sign up for a beer tour, and your guide will teach you all about their methods for beer production. 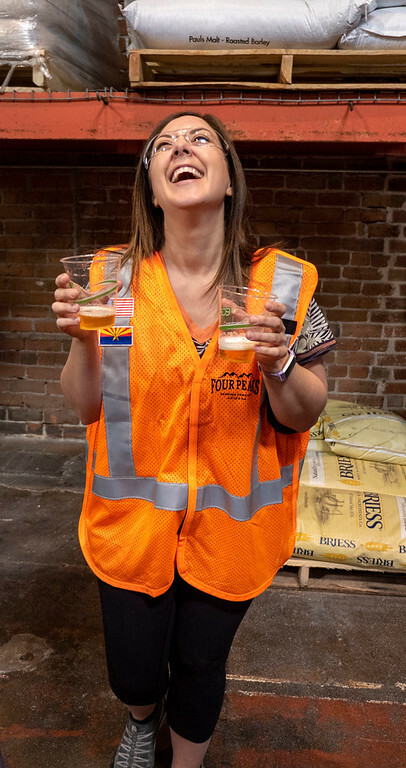 I think that this was one of the most thorough and well explained beer tours I’ve ever taken. Perhaps it’s because Four Peaks Brewing takes their beer seriously. They even scientifically alter the water composition to create the same water as the style of beer it’s modeled after (now that takes commitment!). The behind the scenes tour was enjoyable and insightful. Most importantly, it didn’t take long until we sampled the beer, too. 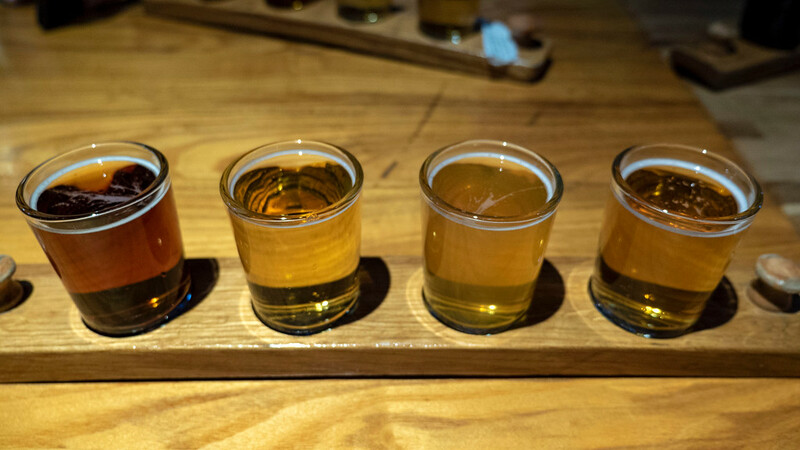 Why not stay for a while after the tour and order a beer flight to try some different varieties, too? I loved ordering a flight of beer because I got to try several that weren’t offered on the brew tour that caught my eye. The 8th Street Brew Pub has many meals that are made with beer, including their delicious beer bread. My veggie beer bread was both colorful and delicious, and they easily altered the meal slightly for my vegan diet. Cheers! If you regularly follow the blog, you’ll know that I’m a huge fan of public art and I try to see some in every city that I visit. 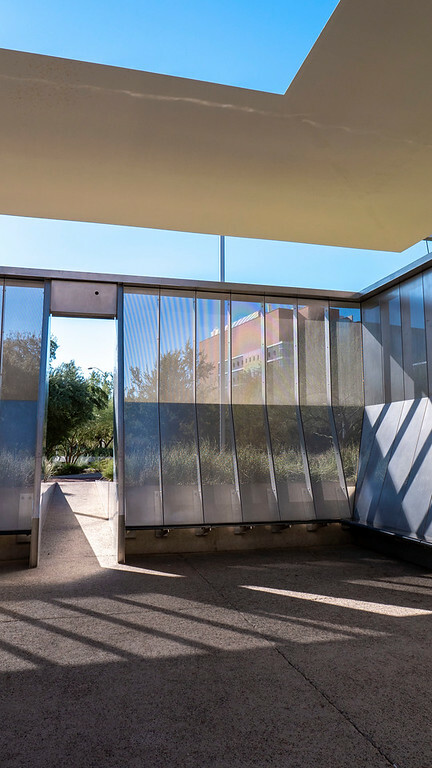 Tempe has no shortage of unique public art and architecture that showcase its artistic and progressive nature. 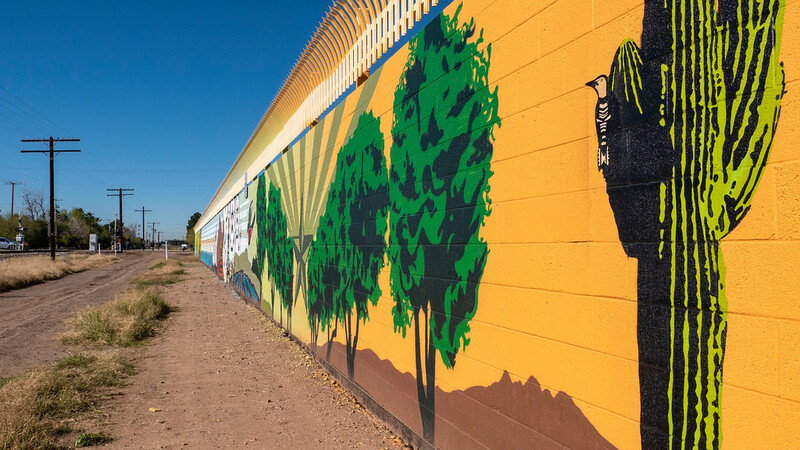 The city promotes and welcomes permanent and temporary public art as an expressive tool that supports and encourages a strong sense of community and belonging. 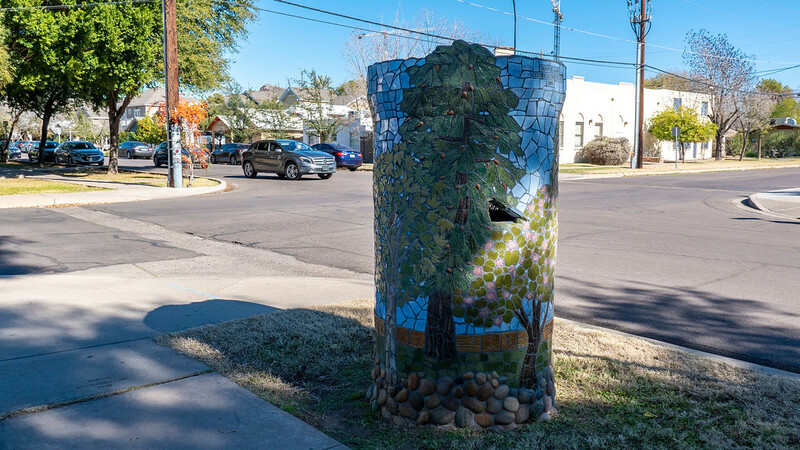 While I only had the chance to see a small portion of Tempe’s public art, I urge you to wander around and explore these art installations that are meant for everyone to enjoy. 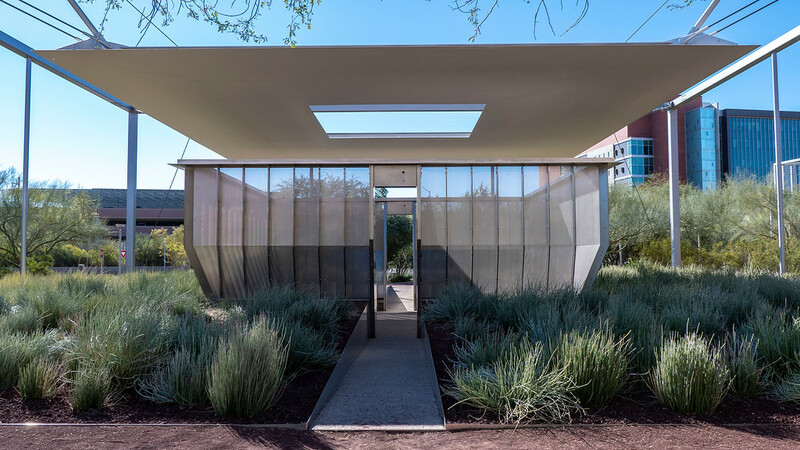 Air Apparent on the ASU campus is one of James Turrell’s famed Skyspaces. Turrell works with light and space in his architectural environments to promote consciousness and new perceptions. Anyone can walk through or into the steel building and sit for a meditative moment on its benches. The ceiling opens up to the sky, framed in changing light (visible at night). The experiences vary at dawn and dusk, and at daytime and nighttime. Therefore, you need to visit on multiple occasions for new perspectives. Whether you’re a student, an art lover, or a general member of the public, you should check out Air Apparent if you have the opportunity. 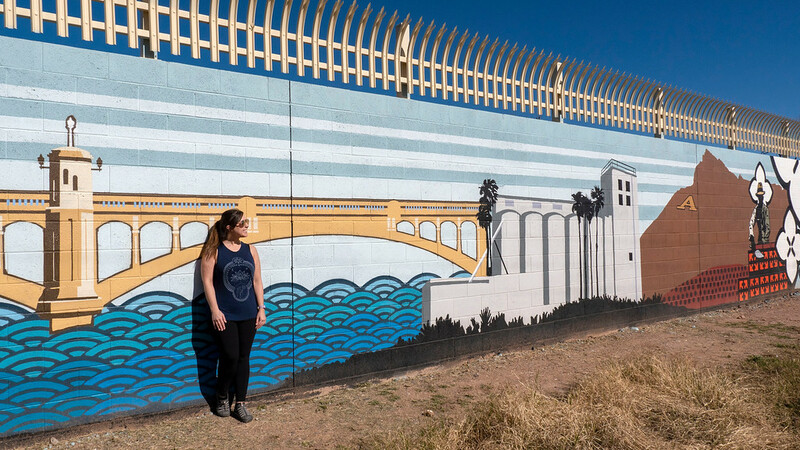 Tempe resident and local artist, Jake Early, has painted a massive mural on a concrete wall that even wraps around the corner. Meet Me at Daley Park illustrates the people, stories, and objects of the neighborhood, as contributed by the residents themselves. It’s bright, colorful, and a wonderful way to represent a neighborhood and its locals. I could already see some elements from around town in the mural, such as the bridge, but other imagery was a mystery to a visitor like myself. It’s beautiful, nonetheless. The Maple Ash neighborhood has its share of historic homes, large trees, and friendly people. 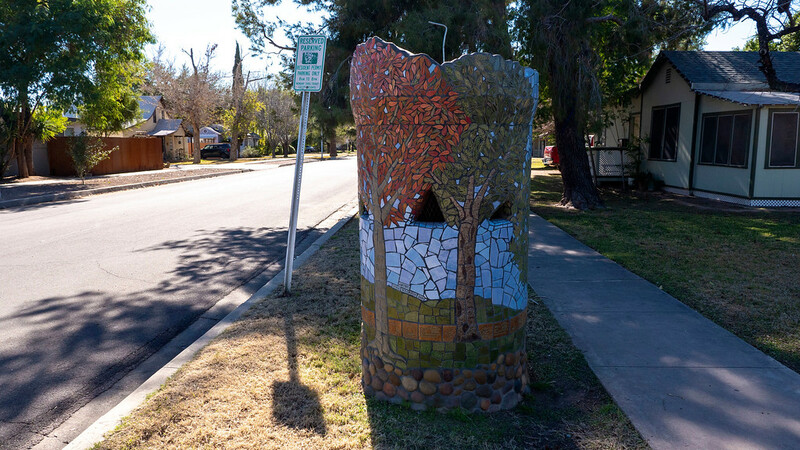 The spectacular public art transforms the appearance of the drab concrete standpipes using ceramic tiles, rocks, and metalwork. 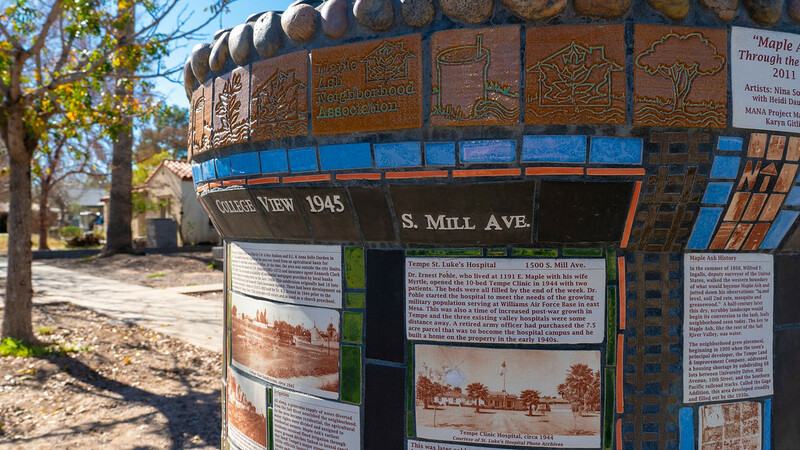 You can learn about this neighborhood’s history through the decorations, and there’s plenty of imagery of plants and water. Take a wander around the Maple Ash neighborhood to see them for yourself. While this doesn’t exactly fall into the realm of public art, it’s an impressive architectural work with an intriguing history. 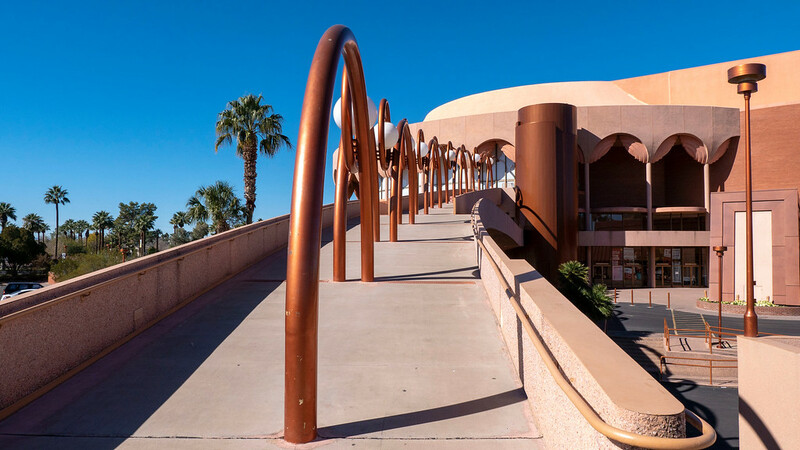 The ASU Gammage Auditorium was designed by Frank Lloyd Wright and features his unique architectural style. 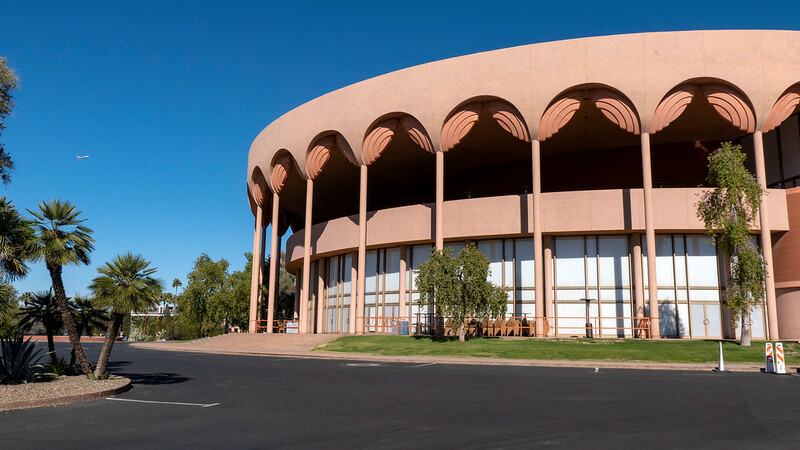 Once conceptualized as a design for an opera house in Baghdad that never materialized, this circular auditorium is one of the largest exhibitors of performing arts at universities in the whole world. Even if you don’t manage to catch a production there, stop by the building if you’re a fan of amazing architecture. 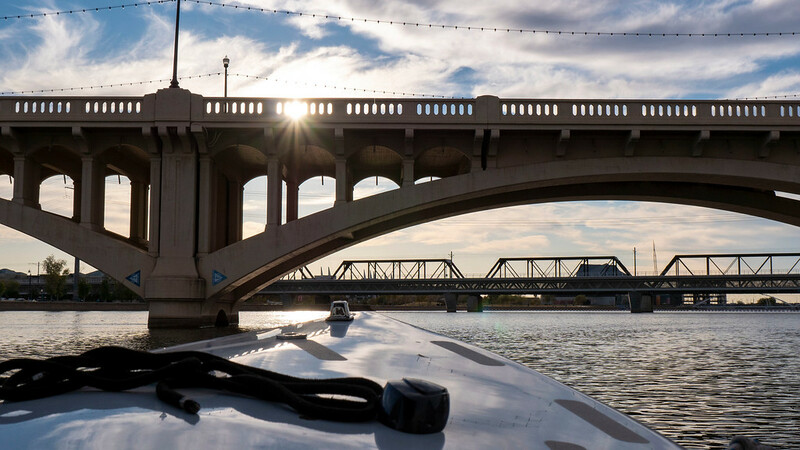 At Boat Rentals of America, there are all sorts of fun ways to explore Tempe Town Lake, whether it’s by kayak, stand-up paddleboard, pedal boats, and more. 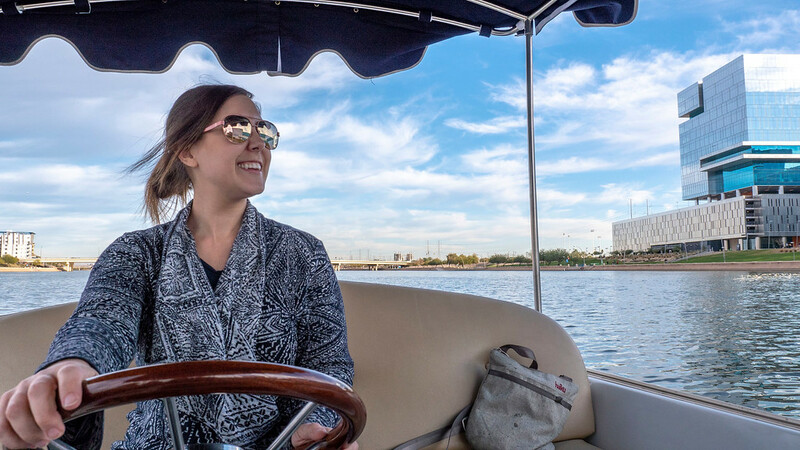 We decided to embark on an electric boat ride as a group to cruise around Tempe Town Lake. We took the electric boat out to the lake ourselves and drove it around without requiring any special boating licenses. The boat does travel quite slowly as it’s not a speedboat by any means. However, the breeze off the lake was so inviting and I just loved drifting along in the sunshine. This was one of those activities that I’d always wanted to try, but laughed at the prospect. I thought I’d be truly horrible at it. Watch out! Thankfully, the teachers at LumberjAxes are incredibly kind, patient, and helpful. I actually warned everyone that I’m terrible at throwing things in general, and to essentially watch themselves. As it turned out, I was able to throw the axe into the wooden wall and have it stick on my second attempt! It was shocking and amazing. 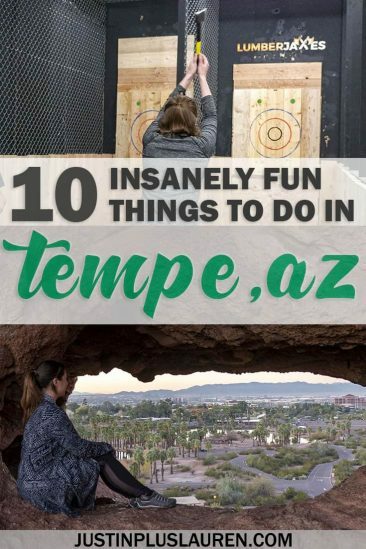 This was one of the most insanely fun things to do in Tempe. You need a bit of skill and a bit of luck to get the axe to stick into the wall. 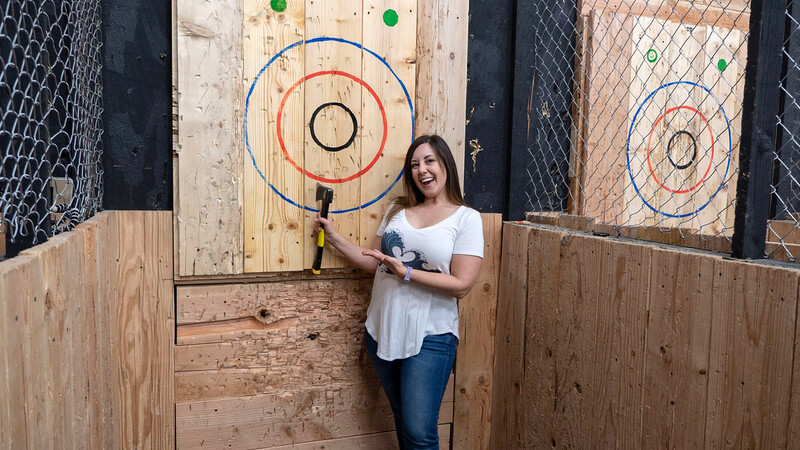 There’s something that’s just really satisfying about throwing axes at walls. It’s not something that you do everyday, and it’s really exciting to throw the axes around with a group of friends. Plus, at LumberjAxes, you can bring food and drink in with you for a little party behind the throwing lanes. 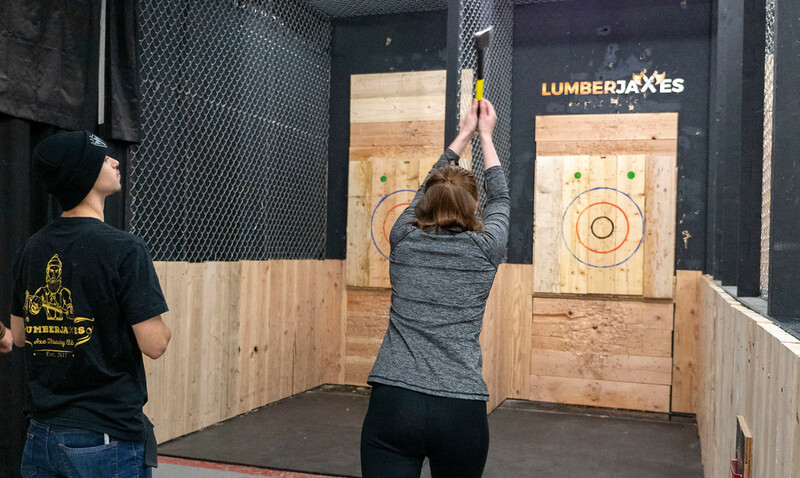 If you’re looking for what to do in Tempe or something to do with your friends, don’t hesitate to try axe throwing at LumberjAxes because you’ll have an awesome time. On my last full day in Tempe, we started out the morning by visiting the wondrous Singh Meadows, a farmers market in town. 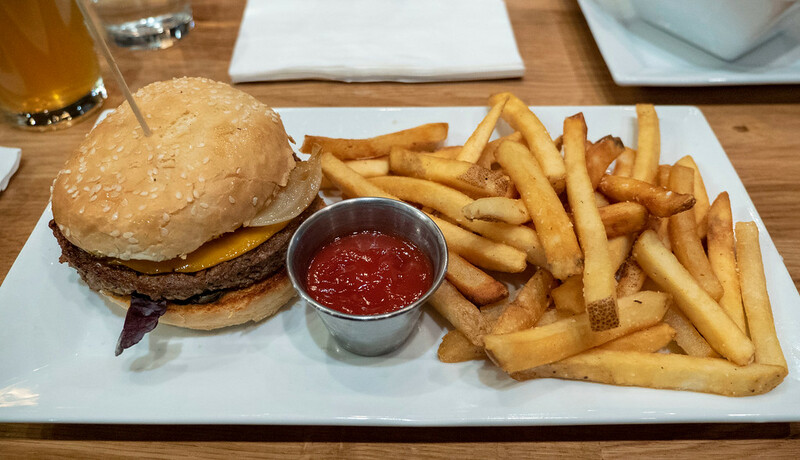 If you love locally sourced food, you’ve come to the right place. 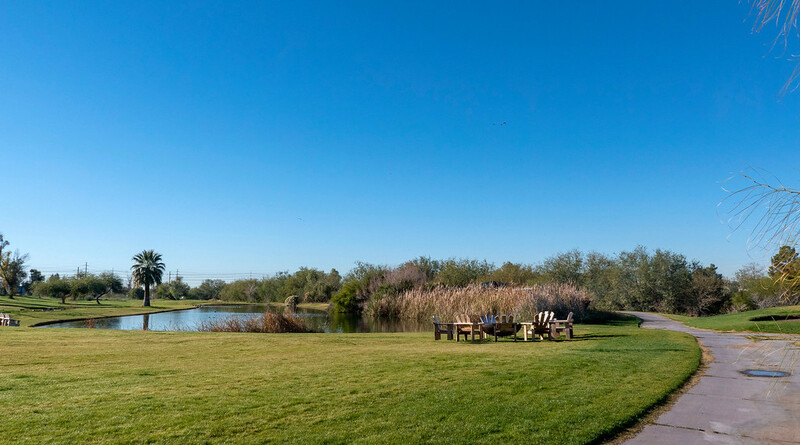 You’ll find Singh Meadows on 75 acres of property with green spaces, walking trails and shady spots. It’s a great place for a stroll or a picnic with the family. 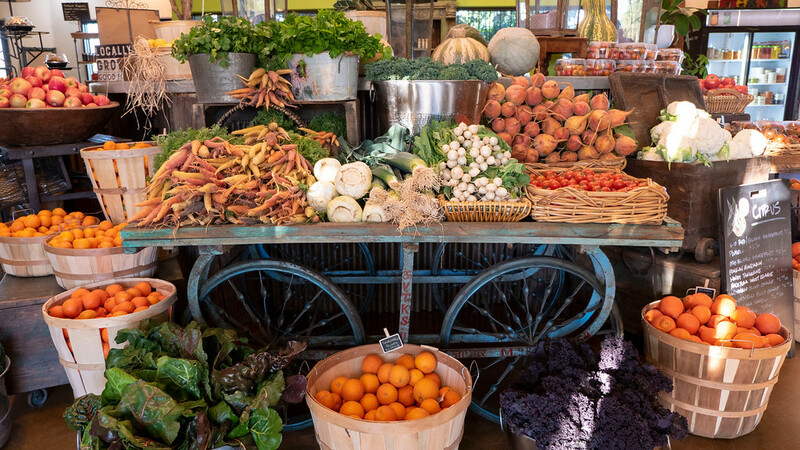 Indoors, you’ll find a bustling farmer’s market with locally sourced food, as well as a 100% organic cafe, coffee and juice bar. When we visited on a Saturday morning, there were tons of samples of various oranges, tangerines, and grapefruit slices to taste. We also stopped here for breakfast, and I am still dreaming about my glorious picnic basket full of delicious eats. Yes, I received my meal in a picnic basket! I ordered the Meadows Picnic Basket with Swiss chard, falafel, tempeh, wheat berry tabouli, and crispy pita (hold the feta for me). The menus change with the seasons, depending on what’s readily available. 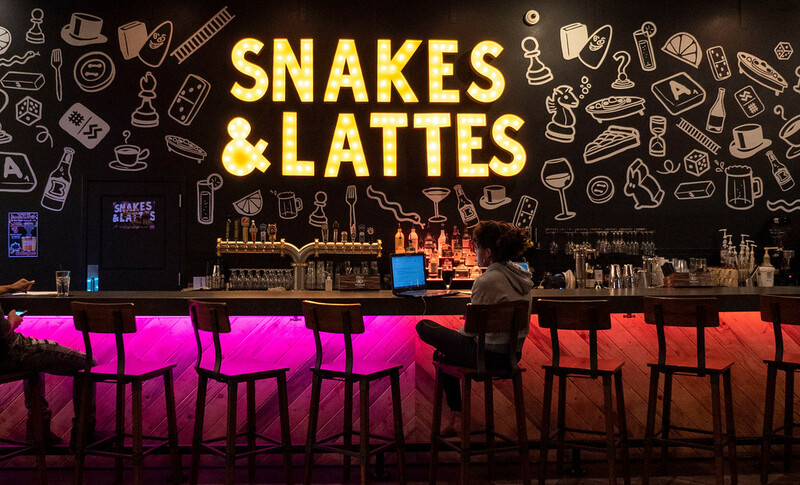 If you’re looking for what to do in Tempe, head to Snakes & Lattes if you enjoy a little competition with your food and drink. It’s a board game cafe that’s based out of my home city of Toronto. Their only location outside of Toronto happens to be in Tempe, so it felt like a little piece of home in Arizona. They have just about every game under the sun, like the ones from your childhood (hellooooo Mall Madness and Dreamphone!). If you’re not sure what to play with your friends, ask one of the helpful and informative employees. They’ll show you a few different games that match the size of your group and fully explain the rules. While you play, order a local beer or a caffeinated beverage. 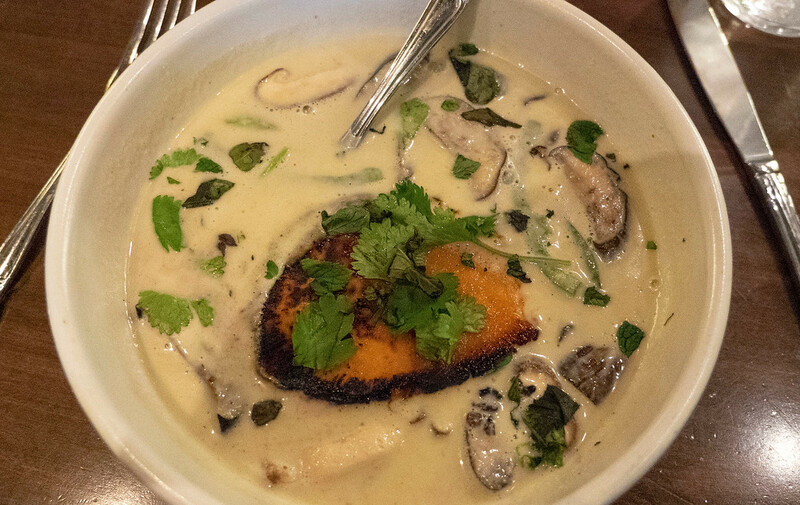 We enjoyed appetizers and dinner at Snakes & Lattes, and I’m always impressed by their vegan options. 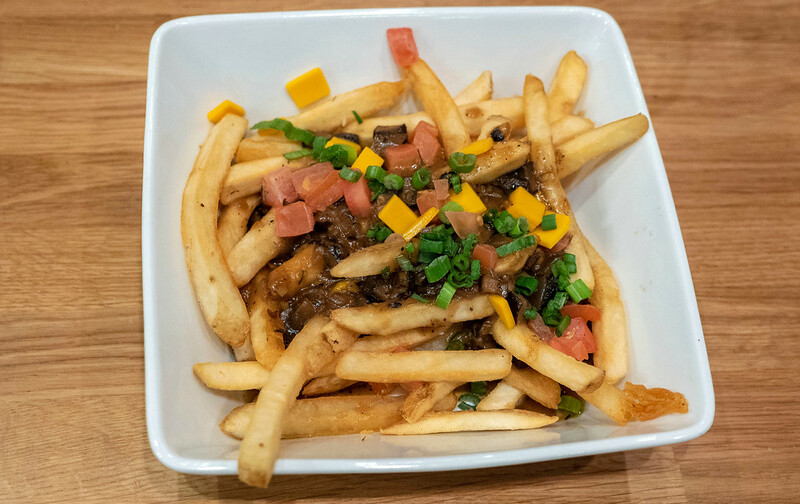 Everyone in the group loved the vegan disco fries, and my veggie burger was outstanding. 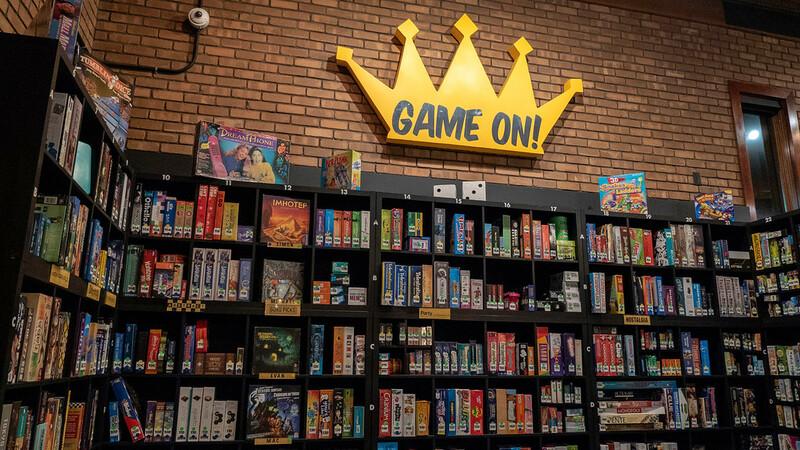 Playing games at Snakes & Lattes is one of the many super fun things to do in Tempe. Besides, beating your friends at games never gets old! If you happen to visit Tempe on a Sunday, run, don’t walk, to the 6th Street Market. 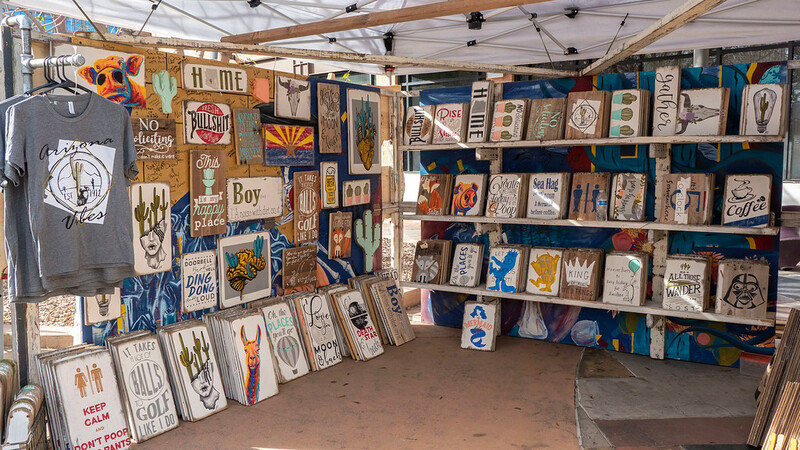 The 6th Street Market in downtown Tempe happens every Sunday between 5th and 6th Streets on the east side of Mill Avenue, between 10:00am and 3:00pm. 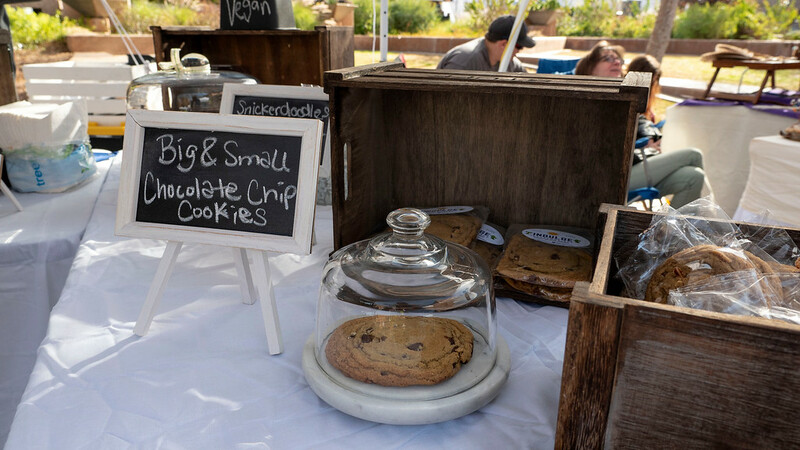 You’ll find up to 100 booths featuring locally made wares by artisans, live music, as well as a ton of intriguing food options. As I had the chance to visit the 6th Street Market right before I flew home, I grabbed some food and snacks to eat before I left (and at the airport). Raul’s Cocina has the best vegan tamales ever, as well as yummy salads to sample (I only wish I lived in Tempe so I could eat their food all the time!). 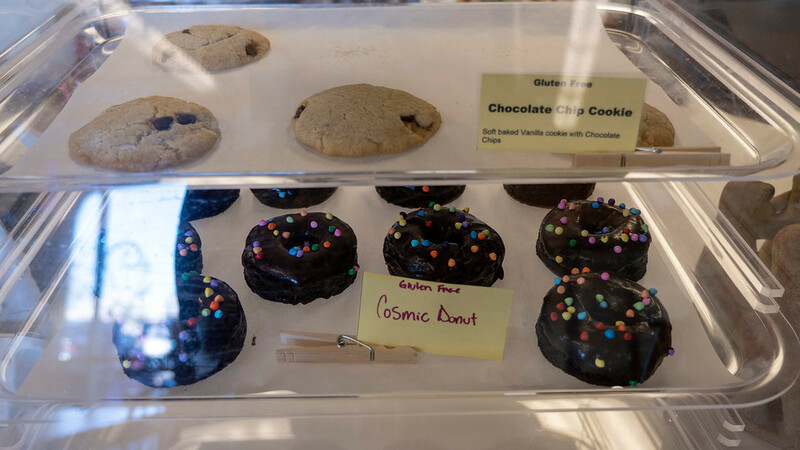 Indulge Irresponsibly is a vegan bakery with some of the best cinnamon buns and cookies. I discovered another vegan dessert stand at the market, Basima’s Sweet Treats, and I couldn’t resist trying their cookies, too. Yum! I’ll likely end up writing an entire blog post about the coffee that I drank in Tempe. There are so many hip cafes featuring freshly roasted beans and brews. 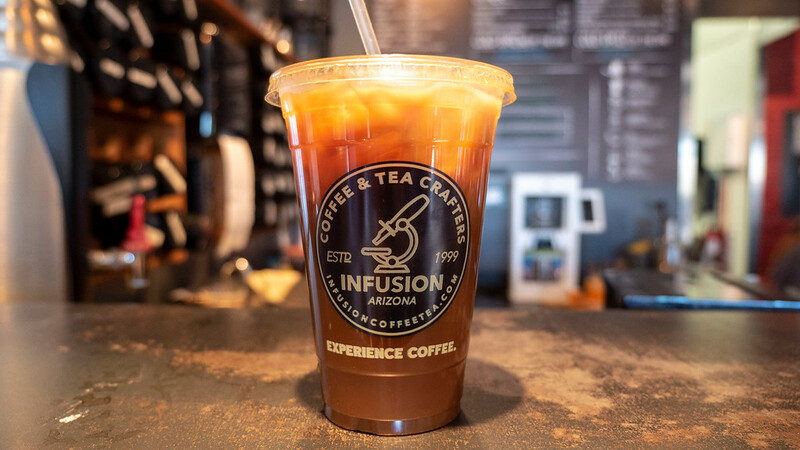 If you’re a fan of coffee, you’ll love traveling to Tempe, trust me. 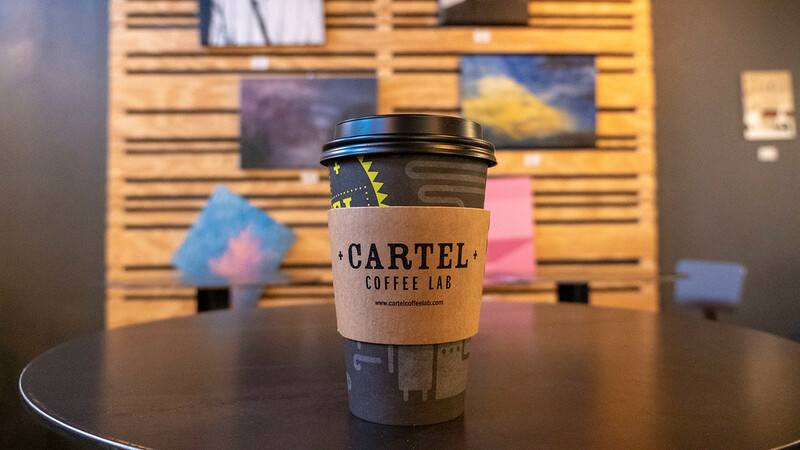 From the intriguing brewing processes at Cartel Coffee Lab to the robust blends at Press Coffee Roasters, you’ll easily stay caffeinated and happy in Tempe. 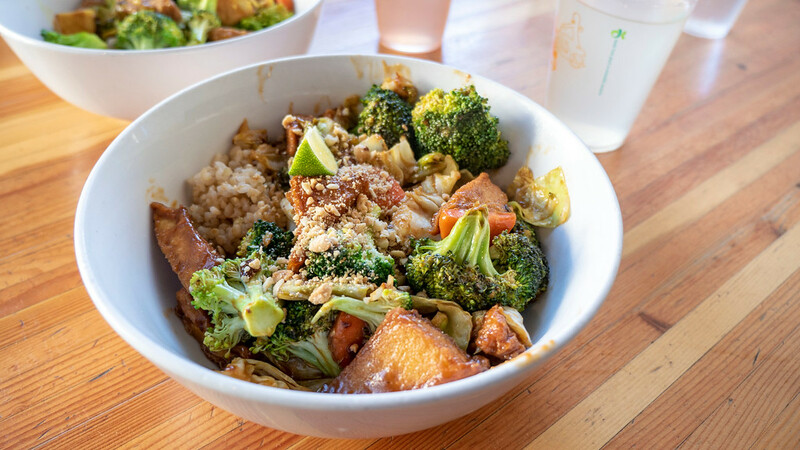 I’ll be going into more detail about the vegan options in Tempe in another article soon. For now, I’ll highlight a couple of my favorite restaurants in Tempe so you can check them out right away. 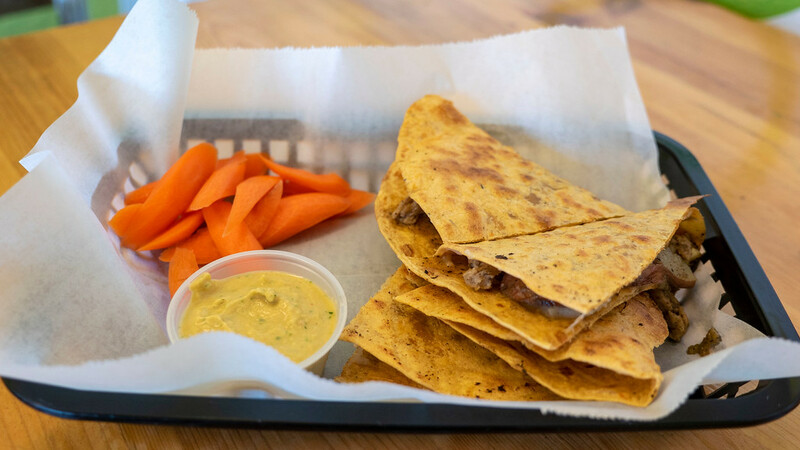 Green New American Vegetarian is one of Tempe’s first vegan restaurants, featuring plant-based comfort foods. 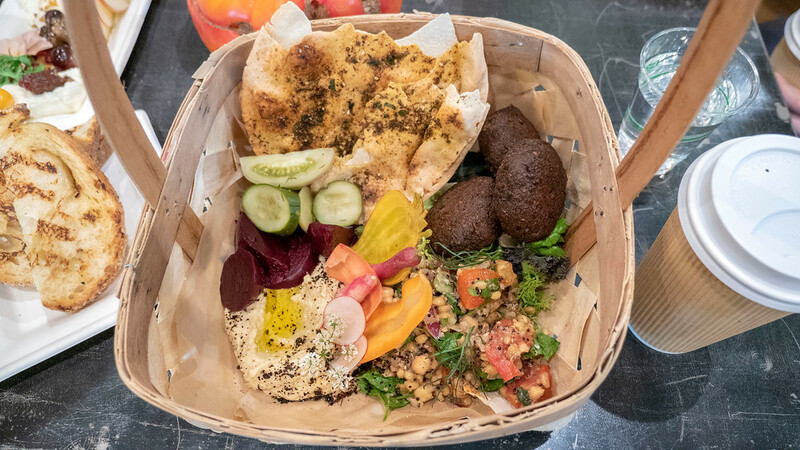 You’ll find enticing meals made out of vegetables, vegan cheeses, and mock meats. I ordered the Thai Peanut bowl with tofu and it was really flavorful with the right amount of spice. Whether you order a bowl, burrito, or burger, you’ll surely be impressed and you won’t miss the meat. For something a little healthier but not lacking in taste, dine at 24 Carrots, a natural cafe and urban juicery. It’s a casual space where you won’t feel weird dining alone, but it’s also a great space to meet with family and friends. I tried their interesting and yummy take on jalapeno poppers, as well as the quesadilla special of the day. Naturally, I couldn’t resist trying one of their desserts either because they looked so irresistible. Once you’re finished your meal, be sure to walk around the corner to the Changing Hands bookstore to find new and used books, as well as charming and unique gifts. Culinary Dropout is such a lively venue that can handle large groups and parties. It seemed like all of Tempe was hanging out there when our group went for dinner! It’s great for live music, people watching, and well, the food! The spicy vegan curry is one of the highlights of the menu, and I especially enjoyed the grilled sweet potato in the middle of the dish. Inspired by the multicultural history of Arizona, New Mexico, Texas, and northern Mexico, Ghost Ranch serves hearty and healthy southwestern fare combined with refreshing cocktails and beer. 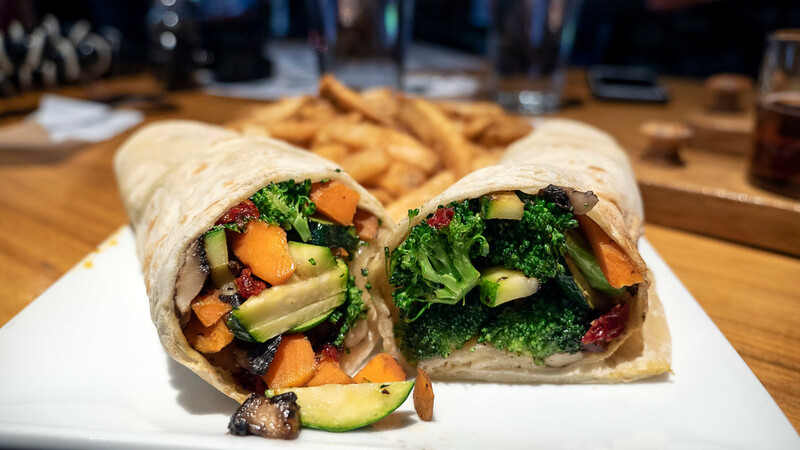 You can clearly see the vegan, vegetarian, and gluten-free meals denoted on the menu. 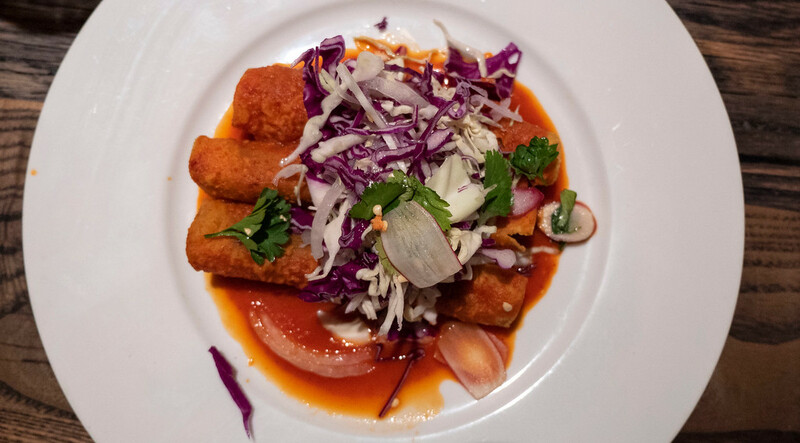 It was a tough choice, but I decided on the vegetable enchiladas smothered in red sauce, which were absolutely delightful. 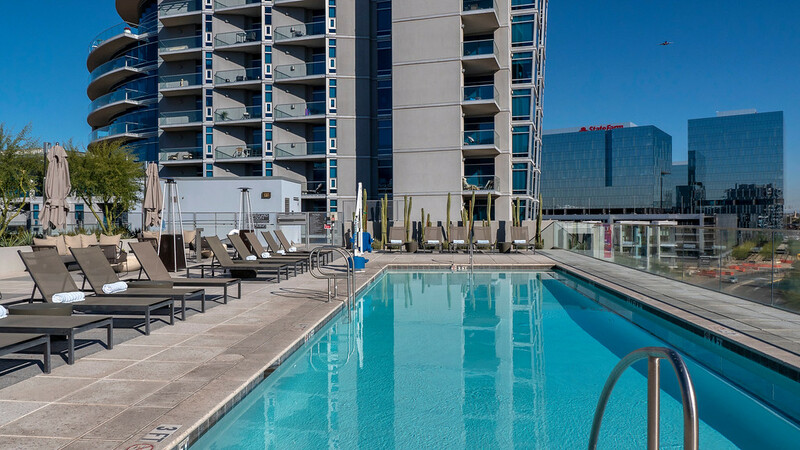 If you’re looking for a luxury stay in a prime location, definitely stay at the AC Hotel by Marriott Phoenix/Tempe Downtown. My room was stylish, modern, and a great place to unwind after busy days out and about. 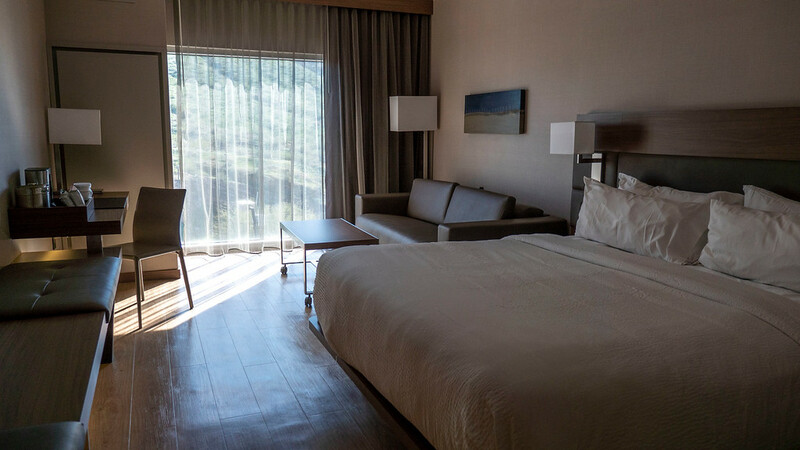 The hotel has every modern amenity, like complimentary Wi-Fi, a bright and clean fitness center, a luxe bar, and an on-site restaurant. The AC Hotel by Marriott has a brilliant rooftop pool and relaxation area where you can lounge in the sunshine. I headed to the pool right after I settled into my hotel room. Feeling the warm sunshine on my skin and swimming in the refreshing waters was so dreamy. Plus, there were great views overlooking A Mountain. Plus, I somehow had the whole place to myself in the mid-afternoon. The rooftop swimming area truly sets this hotel apart from the others. 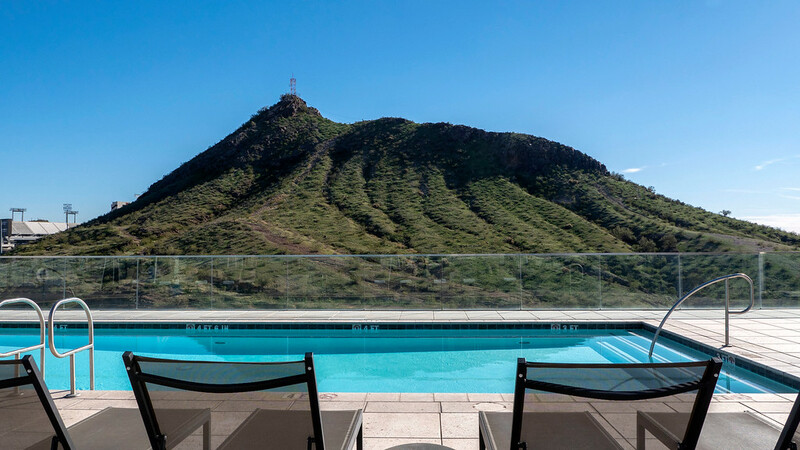 Combined with its excellent location near Tempe Town Lake, downtown Tempe, and A Mountain, the AC Hotel by Marriott should be your first hotel choice in Tempe. Book your stay at the AC Hotel by Marriott and be sure to read reviews by fellow travellers. Want to see more photos from my trip to Tempe, Arizona? Check out my entire travel photography album from Tempe! You can purchase pictures, prints, housewares, and so much more, created from any of my photographs (just click the ‘buy’ button on any picture). So, have I convinced you? 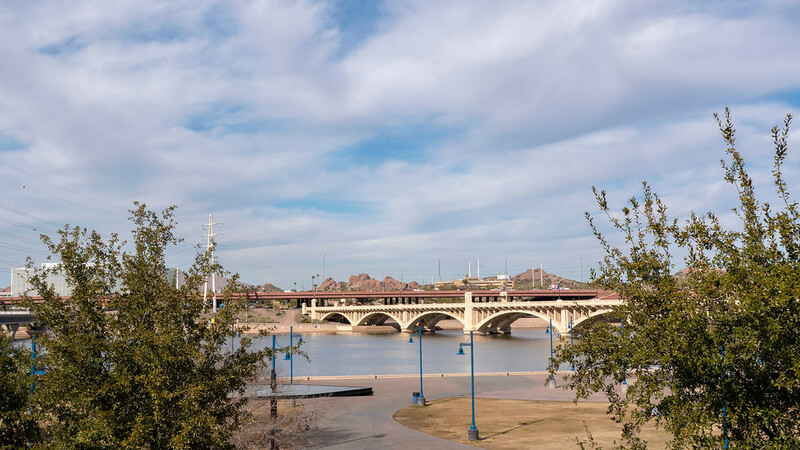 Whether you’re escaping winter or looking for somewhere new to visit, you need to spend at least a few days in Tempe, Arizona. There are so many unique and fun things to do in Tempe AZ. No matter if you’re bringing your partner or hanging out with a group of friends, I guarantee you’ll have a super memorable vacation. 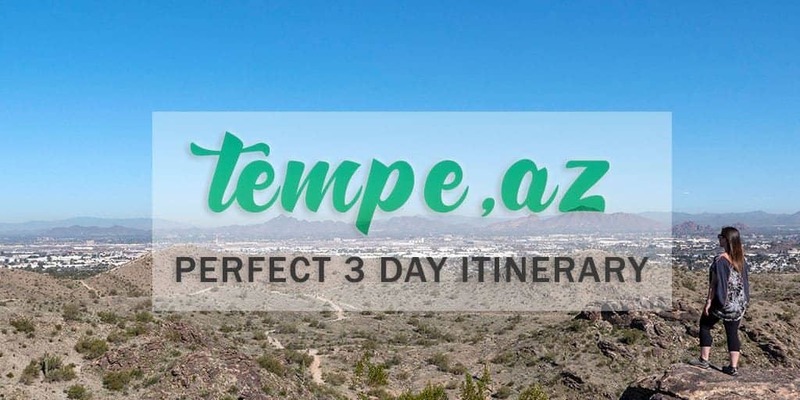 Have you ever traveled to Tempe or anywhere in Arizona? Tell me about your adventures!